Square CEO Jack Dorsey and Snapchat CEO Evan Spiegel just launched a new payment product for Snapchat, Snapcash, which lets users send each other money over private Snapchat messages. The idea was spawned in May 2013, shortly after Spiegel and Dorsey were introduced by a mutual business contact, Peter Fenton. Fenton is a general partner at Benchmark, which is a Snapchat investor. Fenton also invested in Dorsey’s last company, Twitter. 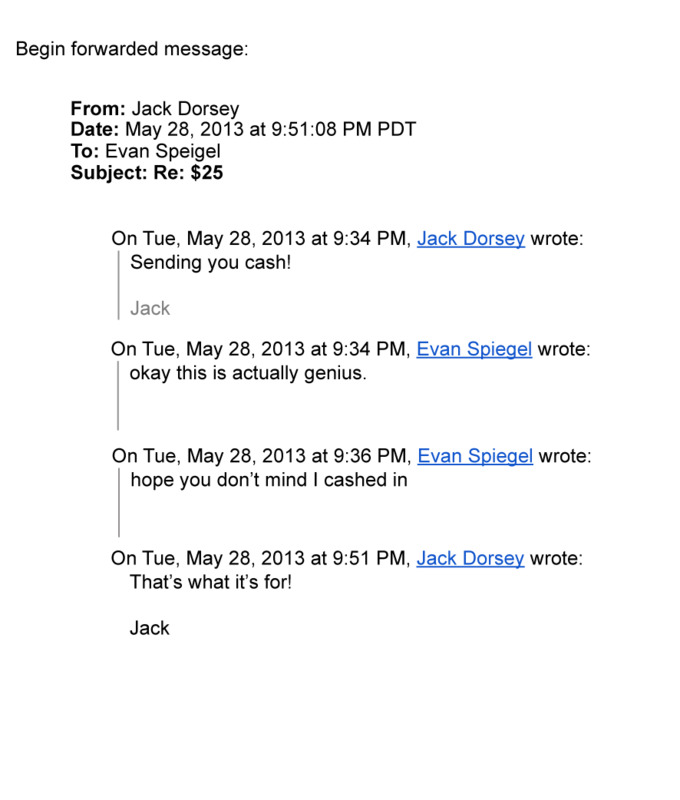 Dorsey was eager to show Spiegel his new product, Square Cash, and he sent Spiegel some money over an email to demonstrate the product, Recode’s Kurt Wagner reports. Spiegel replied to the email, “Ok, this is actually genius.” After that, the pair began plotting SnapCash.